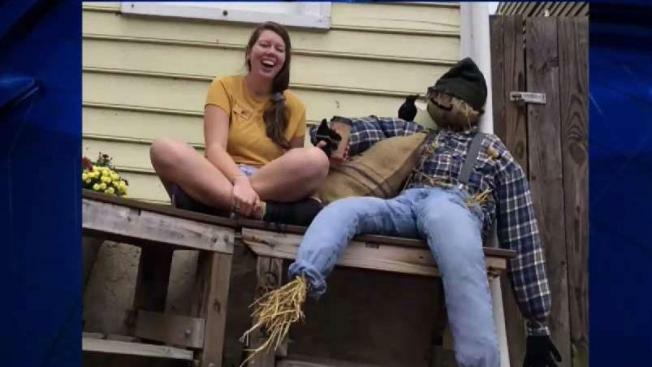 "Whether they thought he was a passed-out person drunk from a night of drinking or a friendly face coming to welcome you into Agora, he just scared and welcomed so many"
Wanted: The scarecrow snatchers of Fredericksburg, Virginia. A scarecrow known as Scaryl Crow has gone missing from the Agora Coffee Shop. Suspects were caught on camera snatching Crow from his post Monday night. Workers at Agora said the kidnapping has left them distraught. "He brought so much joy into my heart," barista John Boelsche said. "Whether they thought he was a passed-out person drunk from a night of drinking or a friendly face coming to welcome you into Agora, he just scared and welcomed so many." Pictures show Crow with his coffee shop colleagues enjoying the fall weather in flannel. "I gotta be honest, it fills me with rage to know that he was taken in such a vulnerable state after being out in the cold all night," said Richard Chambers, the kitchen's assistant manager. Other members of the Agora crew said they have struggled to make lattes in their friend's absence. "We’re surviving. We’re making it through. It’s hard, but we’re doing it," said Kacie Waters-Heflin. All they have left of Crow is a single hand. They asked whoever took Crow to return him — no questions asked. "If we get any part of him back now, I would be happy. Any part. Maybe his other hand," Waters-Heflin said. Anyone who saw anything or who has any information is asked to contact the coffee shop.